This week, The Past Present turns its attention to one of the many beautiful and somewhat iconic buildings around Sydney. Sydney has spectacular architecture displayed in many of our old buildings. 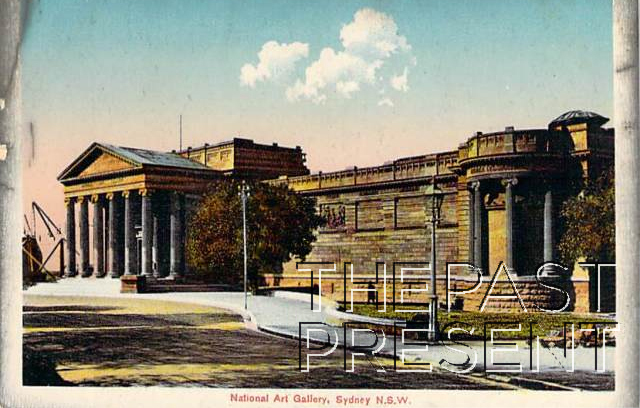 One of the most spectacular, with its beautiful facades and imposing columns, is the Art Gallery of New South Wales, pictured above on a postcard from the early 20th century. Intriguingly, note the building work going on, indicating that, at the time of the postcard, the Art Gallery was yet to be completed! The Art Gallery of New South Wales has its inception in the 1870s,when an Academy of Art was established to promote fine arts in Sydney. With funds contributed by the Government of the time, the Academy purchased the first works to be held in the collection of the Art Gallery of New South Wales. Over the next decade the collection developed and grew, and a permanent home to house the collection quickly became a necessity and John Horbury Hunt was asked to submit plans for the gallery. This original building, which became known as ’the Art Barn’ was not much more than a series of thick walls, but provided a temporary home until funds for a more appropriate building could be obtained. In 1889 Hunt was asked to complete a further set of plans for the gallery, and in total he submitted three designs. However, none were viewed as appropriate, being too large, too grand, and too much a hybrid of architectural styles. The trustees of the gallery really wanted a Classic Ionic design, a temple to art in the Greek style, and they looked to Walter Vernon to provide it. At the time, this was quite different to the type of architecture Vernon was known for, but his design certainly met with the demands of the trustees, though what we see today is a little more austere and less ornamented than Vernon envisaged. The building was completed in four stages and by 1901 the southern half of the building had been completed and in 1909 the front of the gallery was complete. However, nothing further of Vernons designs was built, despite plans to do so during the 1930s. Further extensions to the building were completed in time for the 1988 Bicentenary, and there have been many additions and alterations since. This entry was posted in New South Wales, Sydney and tagged 1900s, 1910s, buildings, history, postcard collection, sydney.